I send my congratulations and good wishes to the Editor and all those concerned with the preparation, publication and distribution of the Bulletin of Tanzanian Affairs as it issues its 50th Number. I know from my brief visits to London that without the Bulletin it would be difficult for UK members of the Britain-Tanzania Society (and other interested persons) to follow events in my country – and the rapid changes which have, for better and for worse, been taking place in recent years. The Bulletin is also helpful for members of the Tanzanian chapter. As far as is possible, it reports without mixing fact and opinion; further, many of the articles in it give an excellent analysis of serious Tanzanian documents and events unmatched in easily accessible publications here, and less subject to the natural bias and strong opinions of those of us directly involved in one way or another. Please keep up the good work. Tanzania, and I believe Britain also, benefit from such aids to international understanding as we in this country try to maintain Tanzania’s stability, unity and people’s involvement in their country’s governance. The first editor of the Bulletin, Terence Ranger, has also sent his congratulations to the present editor from his sabbatical leave in Zimbabwe. President Nyerere in his recent state visit told the audience at a banquet in the Guild Hall that ‘some very flattering things have been said about me since I arrived in Britain as the guest of Her Majesty the Queen …. Other things have not been said; in polite company it is not customary to dwell on a guest’s errors or faults, or the failures of the country he represents. I can assure you that I appreciate this convention – and propose observing it in reverse!’. But in the less polite company of academics in Oxford the President himself dwelt for a moment on Tanzania’s weaknesses: ‘We call ourselves a democratic and socialist state. In reality we are neither democratic nor socialist. The Patrons of democracy and the Cardinals of socialism have no idea how much sympathy I have with them when they ridicule and dismiss Tanzania’s claim to democracy or to socialism. Democracy and socialism require a mature and popular awareness of the dignity and equality of men and women; a dynamic and popular intolerance of tyranny: a degree of maturity and integrity in those entrusted with responsibility for the institutions of State and Society; and a level of national and personal affluence which Tanzania and Tanzanians do not possess. Many of our people suffer from permanent malnutrition and all the mental and physical illnesses which go with it; their poverty and general ignorance make a mockery of talk about human freedom. We have the village tyrant and the insensitive bureaucrat. We have the habits of arbitrariness; some as the lingering vestiges of colonial rule, some of our own making. We have judicial procedures which, to say the least, leave a lot to be desired. We have a law on the Statute book under which an individual may be detained without trial. We have the traditional prejudice and discrimination against women. We still have a love of exerting authority, and an intolerable degree of submission to authority. And we also have a level of incompetence, and even irresponsibility, which often makes nonsense of our claim to be implementing policies in support of equality and human dignity’. I imagine that few members of the Society would wish to be more critica1 than that! A good deal of this Bulletin will consist, however, of what could be called ‘official handouts’, that is to say the texts of President Nyerere’s speeches while in Britain, and some of them are important statements of Tanzanian policy in previous months. What Nyerere said during his state visit was addressed particularly to people in Britain and it should certainly reach at least all members of the Society. So this issue will begin with extracts from these documents, will continue with reviews, and conclude with compiled items of news. The week before this issue went to press was a period of high drama in Dar es Salaam. Tanzanians were reeling from revelations produced earlier which had indicated the massive scale of tax avoidance which had been occurring in the country – it apparently amounted last year to about a quarter of the whole estimated annual revenue of the nation. There had been some indication of trouble ahead in January 1994 when the Minister of Finance had had to introduce a drastic mini-budget to cover a serious shortfall in revenue collection. But people had to wait until November to be told the true extent of the losses to the national exchequer. At the same time, Father of the Nation Julius Nyerere published a book, which rapidly became a best seller, in which he roundly criticised Prime Minister John Malecela and ruling CCM Party Secretary General Horace Kolimba and called for their resignation. Within a very short time, and as further illustration of the influence still exercised by Mwalimu Nyerere long after he has given up executive power, the Prime Minister and Secretary General were removed. “Effective today I am ordering a full investigation into the rampant tax evasion that is taking place in this country – It has been brought to my notice that import tax and duty collection reveal a major loss of tax revenue both through fraudulent illegal practices and administrative leakages” – so began the official statement from President Ali Hassan Mwinyi. He went on to explain that early in 1994 the government had contracted the services of two foreign pre-shipment agencies to assess and help collect import taxes in addition to their task of pre-shipment inspection. The information that the companies had provided indicated that the level of lost revenues for the past financial year was about TShs 70 billion which is almost a quarter of the total estimated tax revenue of TShs 292 billion. The president went on: “I have ordered the Controller and Auditor General to immediately proceed with verifying the available data on importers and to carry out a complete audit of the bonded warehouses. The Attorney General will lead a full investigation into each case to determine whether a violation of the law has taken place and to prosecute offenders”. “I want to make it absolutely clear that there will be no negotiation of the taxes to be paid he said. “Whatever the Controller and Auditor General verifies as the rightful tax will have to be paid in full. These actions will be conducted within the next three months. Government action will not stop there. There is evidence to suggest that there are illegal importers who completely evade the existing tax system. The channels used by these people are the transit routes, where goods declared to be heading to neighbouring countries are diverted en route and sold in the Tanzanian market without payment of taxes”. The Societe General de Surveillance is understood to have handled 2,000 tax exemptions between January and October and in a 56-page report to the President had named prominent businessmen, companies, public institutions and civil servants who had not paid the required taxes. The confusing signals earlier this year from Finance Minister Kighoma Malima on discretionary tax exemptions for new investors, which had damaged investor confidence and had had to be corrected later by the President, were also referred to in President Mwinyi’s latest statement. “There is evidence to suggest that there is significant abuse of the Investment Promotion Centre exemptions. Treasury discretionary exemptions need to be sharply curtailed. The abuses hurt the legitimate business community which is investing in this country and the abusers must be caught and prosecuted. No exemption will be effective in future unless it is gazetted and published in a newspaper”. A few days later the first actions were reported. 18 containers destined for a company building three safari lodges were seized pending clarification from the company of the amount of tax exempt goods it had imported under investment promotion concessions. The containers were said to include enough carpets to cover ten football pitches – far more than needed for the three lodges. Some businessmen claimed that it was necessary to evade tax because the rates were so high – up to 170% in some cases. The local press began to publish details of some of the other transactions likely to be investigated. Some companies had imported tax exempt oil for soap manufacture (under provisions for tax exemption for raw materials) but the quantities were so large that much of it had been tinned and sold as edible cooking oil. Another company had been allowed to import 20 tax exempt vehicles but instead of doing so it had imported thousands of new tyres which represented its main business. A vessel was said to be plying between Hong Kong and Zanzibar, offloading goods in Zanzibar which then found their way to the mainland. To add to the general concern, on November 17th the Controller and Auditor General presented his 511-page report for 1992/93 which contained more bad news. TShs 418 million in cash and property had been embezzled and TShs 11.6 million of payments suspected to be dubious had been made. This compared with total losses of TShs 226 million in 1991/92. Within days of President Mwinyi’s announcement the Deputy Treasury Principal Secretary, who had been responsible for signing tax exemption certificates, was removed from office but many observers wondered why responsibility was not being accepted at a higher level. Donor agencies began to express alarm. An official of the Belgian Agency for Development Cooperation said that tax exemption and revenue collection problems were not caused by one individual. The problem was both institutional and political. Norwegian Minister for Development Cooperation Kari Nordheim-Larsen said that she viewed the matter extremely seriously and immediately withheld TShs 8.1bn (US$ 15 million) balance of payments support. The Swedish Ambassador announced the next day (November 17) that Sweden had suspended the release of TShs 7.3bn ($13.5 million) due to the country’s mismanagement of revenue collection. The following day President Mwinyi called representatives of 14 foreign and international donor agencies to State House (Ikulu) and made an appeal to them to continue to disburse approved funds “short of which Tanzanians would suffer and measures taken to adjust the budget would prove futile”. At this meeting, according to the Daily News, the Canadian representative asked why the Minister of Finance did not resign. Replying to allegations by the representative of Denmark that Tanzania had corrupt leaders, President Mwinyi said that anyone caught evading tax would be dealt with according to the law. Tanzania faces a budget deficit of TShs 221 billion this year of which the government had hoped that some TShs 168 billion would come from foreign donors. The Minister of Finance had had a difficult time during the 1994/95 budget debate in Parliament in August. Professor Mbawala (National MP) had said that the Treasury had been weak in collecting taxes because it had concentrated on small traders while leaving big-time businessmen to go scot-free. He accused the Minister of amassing powers and ignoring directives from the cabinet and the President. At the meeting of the National Assembly in August a private member’s motion to re-introduce a leadership code and declaration by leaders of their personal property had received the support of the government and had been passed unanimously. A new book ‘Uongozi Wetu na Hatima Ya Tanzania’ (Our Leaders and the Destiny of Tanzania) by Mwalimu Nyerere was launched on November 2nd before 100 local and foreign journalists and rapidly became a best seller. At the launch the former President called for the resignation of Prime Minister and First Vice-President John Malecela and CCM Secretary General Horace Kolimba because they had failed to advise President Mwinyi on various important issues. Mwalimu referred to Zanzibar’s abortive entry into the Organisation of Islamic Conference (OIC) in late 1992, demands by some members of Parliament for a government for Tanganyika and the issue of the Vice-presidency. “I am surprised” he said “that the President has not yet acted on the Prime Minister. A Premier is not his cook…he is a national leader; if he were his cook nobody would have cared…. since his master will dictate the taste of food he wants. The situation is totally different with leaders whose acts have far reaching consequences for the destiny of our nation” he said. He had advised them to resign last year in Dodoma but they did not. He would never keep quiet if things went wrong with the leadership. The Dar es Salaam Express quoted him as adding: “It would be fine if these crooks (the current leadership) were to go”. Nyerere advised the people to put up with President Mwinyi until he finished his second term because calling for him to step down now would shake the nation which was already passing through hardships and bad leadership. Asked to comment on his past attitude towards criticism and the fact that he detained his political opponents, Nyerere said he did not recall detaining anyone who stood on a podium to criticise him – Daily News and Business Times. When a new Prime Minister is selected by the President the nomination has to be approved by Parliament. President Mwinyi chose Mr Cleopa Msuya, who has held the post before, as the new Prime Minister. He received 165 votes but 43 MP’s voted against him. President Mwinyi also decided to change the Secretary General of the ruling CCM party. Mr Lawrence Gama (formerly Regional Commissioner, Tabora) was elected to the post by the National Executive Committee (NEC) of the party by 132 votes to 21. There then followed three days of speculation about the composition of the new cabinet before the President announced that there would be four new ministers, three new deputy ministers and a number of other changes. Two ministers left the government. Although the former Prime Minister became a Minister Without Portfolio and the Minister of Finance was moved, many observers were surprised that more radical changes had not been made. The opportunity was also lost of reducing the size of the cabinet in the interest of economy. Home Affairs: Ernest Nyanda (formerly Mwanza Regional Commissioner). This was one of the biggest surprises in the reshuffle. The previous minister, Augustine Mrema, had achieved great popularity in his vigorous attempts to root out corruption, correct injustice and defend women’s rights. In doing so he had a number of brushes with the judiciary and presumably made some enemies. Another factor in this change might be the seriousness of unemployment which will be in Mr Mrema’s portfolio in future. Finance: Lt. Col. Jakaya Kikwete (former Minister of Water, Energy and Minerals). See page 27 of this issue. In spite of the financial scandal, the ruling CCM party won an overwhelming victory in local elections in November. This bodes well for its chances in the presidential and parliamentary elections scheduled for October 1995. Of the 2,418 council wards the CCM took 1,191 unopposed and more than 80% of the others where opposition candidates stood. However, the Electoral Commission had had serious difficulties in registering electors and only about 10% of eligible voters were eventually registered to vote. There was widespread apathy amongst voters, especially in the cities. It has not been possible to obtain all the results but figures from the following regions and districts indicate the massive scale of the CCM victory. Eleven opposition parties took part in the elections. To the surprise of many observers all seats were won by the CCM. In the case of incumbent Mayor Kitwana Kondo the opposition parties agreed that UDF’s candidate (Abbas Mtemvu, son of Zuberi Mtemvu who was an active anti-TANU politician during the independence struggle) would be the only person to stand against him. However, the CCM steamroller ensured that Mr Kondo would be successful. He got 915 votes to Mr Mtemvu’s 558. Mr Mtemvu subsequently took this issue to court. A verdict is awaited. The CCM won every seat in the DODOMA, LINDI, MWANGA, NGORONGORO, CHUNYA, BIHARAMULO, NGARA, KILOSA, MUFINDI, MULEBA, MTWARA and NJOMBE districts. Observers believe that the reasons for the CCM victory include the lack of information in remote areas about the essence of multi-party politics and the opposition’s lack of funds. Several donor agencies are funding an electoral education programme which is just beginning. Also, Radio Tanzania, the main source of news, has done little to let people know about opposition activities. There is a widespread feeling that election of opposition parties could lead to chaos in the country and danger to peace and harmony. The CCM is often regarded as the only party with integrity. The behaviour of the opposition parties has not helped their cause. They are divided against each other and within themselves. There are too many of them – 13 are registered – and efforts to unite as one party – UDETA – have made little progress. The parties themselves keep falling asunder. The most powerful opposition party in Zanzibar, the CUF, has a major leadership problem. The mainland Chairman has split from the Isles’ Vice-chairman. The latter, Seif Shariff Hamad, has taken over as acting chairman of the party. The UMD is also suffering from quarrels between its leader Chief Fundikira and Christopher Kassanga Tumbo, the Secretary General. The CCM obtained 83.13% of the 28,718 votes cast but some 16,598 of the 45,316 people who had registered to vote did not turn up at the polling stations. This result broke the trend of increasing support for opposition parties which had been evident in the first four multi-party by-elections (Bulletin No. 49). A probable explanation lies in the absence from this by-election of the three parties which had received significant support at previous by-elections – CHADEMA, the CUF and NCCR-Mageuzi. The parties were protesting at what they claimed was lack of fairness. So confident is CCM of winning next year’s elections that President Mwinyi has announced that the next CCM government will give opposition parties able to garner at least 5% of the votes 20% of the seats in Parliament. 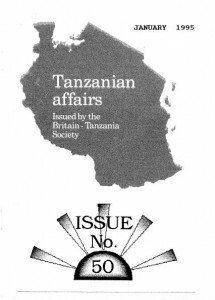 The September issue of ‘Kumekucha’, the publication of DANTAN, the Denmark-Tanzania Society, was devoted almost entirely to Zanzibar and, unusually, was written in English and mostly by one writer, Dan Suther. Zanzibar President Dr. Salmin Amour was interviewed about the economy. Despite its meagre resources, most of the East- West trunk roads in Unguja and some of the roads in Pemba had been repaired he said. The Northern road was almost 75% completed and the Southern road 60% complete. Speaking about future economic prospects Dr. Amour said that he saw Zanzibar as a supplier of services for rather than a competitor of its neighbouring countries. There would be more trans-shipment of goods from outside destined for East and Central Africa. On politics Dr. Amour said that the Civic United Front (CUF) represented very strong competition for the CCM. “One of the most confident organisations I have ever come across – they are over-confident” he said. “They claim that we don’t give them media coverage. But the CUF do not want the cooperation of the media. They have quarrelled with newsmen for not attending their meetings. The media is made available to parties during elections but as soon as elections are over the news media become the property of the state, of the government ….. to use as it sees fit”. Subsequently, in a meeting with British High Commissioner Roger Westbrook, Dr. Amour said that foreign election observers would be welcome during the 1995 elections in the Isles. The CUF’s Vice-Chairman was also asked about the political situation in the Isles. Seif Shariff Hamad said that should elections be held now CUF would get all 21 seats in Pemba and at least 14 out of 29 in Unguja. But on the mainland none of the opposition parties were strong. CUF would probably get a few seats around Tanga, Mtwara, Lindi, Shinyanga and Tabora but the CCM would win overwhelmingly. Mr Hamad went on to say that the Union was in a mess today. Tanganyikans were complaining; Zanzibaris were complaining; the only person defending the Union was Nyerere. “We have to have major surgery on the Union” he said. As for the media he said that CUF allowed them to come to their early meetings but got so little subsequent coverage that they were told not to bother to come in future. CHADEMA and NCCR-Mageuzi have made it clear that they are in favour of a government for Tanganyika. Commenting on a recent meeting between Mwalimu Nyerere and Seif Sharif Hamad (the topics discussed have not been revealed) the Business Times’ satirist Joe Dotto claimed that quite a few ‘Honourables’ in Tanzania (he was referring particularly to the CCM leadership in Zanzibar) placed a great deal of importance on symbols such as flags, songs, dances and, even walking sticks. Some even believed that Nyerere had magical powers that derived from the Maasai stick he always carried around with him. ‘They are terribly scared of the man’ he wrote. The issue of the future status and method of election of the Vice-President of the United Republic has been a bone of contention ever since Tanzania opted for multi-party politics. The matter came to a head at the November meeting of Parliament in Dodoma after the cabinets of the Union and Zanzibar had met to resolve the problem. First, the Speaker of the House said that such a meeting had been unconstitutional – the matter should have been discussed by the Constitutional and Legal Affairs Committee of Parliament. The CCM had originally decided that the Vice-President would be a running mate of and be chosen by the President of the Union. Zanzibar objected that this could mean that both posts could be filled from the mainland and wanted the present system under which the President and Vice-President must come from different parts of the Union to continue. It was then pointed out that a situation could arise where the President and Vice- President might belong to different parties which would not be practicable. The matter was awaiting resolution as this issue of Tanzanian Affairs went to press – Daily News. In a wide-ranging and revealing speech on October 5 1994 at the School of Oriental and African Studies (SOAS), in subsequent questions and in discussion with ‘Tanzanian Affairs’, Chief Justice Francis Lucas Nyalali spoke about the substantial changes which have taken place since independence in the functions and power of the judiciary in Tanzania. There follows a summary of what he said. For almost thirty years Tanzania, under the inspiration of what came to be widely known as the Arusha Declaration, assumed the form of a one-party state with the aspiration of establishing a society based on African socialism. Partly as a result of the collapse of the Soviet Union and partly because of peculiar circumstances within Tanzania, this one party state came to an end in mid-1992. Early in 1991 a Presidential Commission of Inquiry had been appointed by President Mwinyi, to determine whether Tanzania should transform itself from a one-party state into a multi-party state. I had the privilege and honour of being appointed to head that Commission. Although the Commission found that 80% of the people of Tanzania did not want to make the change, the Commission’s recommendations were in favour. The bulk of the recommendations were accepted by the relevant authorities and subsequently attracted popular support. Obviously, the transformation of a one-party state into a multi-party democratic state necessarily entails corresponding reforms of the law to reflect and underpin the new democratic order. – the programme of codification of African customary law, initiated soon after political independence, died a natural death towards the end of the 1960’s. There are endless illustrations of this state of affairs right up to the time when the historic decision to change from a one party to a multi-party democratic state was made. It is realized in Tanzania that, under a multi-party democracy, law and government must replace political party ideology and organisation as the fundamental bonds which hold people together in the nation state. There can be no doubt that, without establishing law and government or such new bonds, the process of change from a one party state could lead to the disintegration of society. There are numerous illustrations of this phenomenon including Somalia, Rwanda and former Yugoslavia. – a free flow of information. Obviously, in order that law may serve as a crucial bond between the people within the nation state, it has to be law which is common to all the people and has to be reasonably known to a reasonable number of people. In Tanzania, there are two kinds of law which are not common to all the people. These are customary law and Islamic Law. During the first half of the 1960’s a programme of codification of customary law was undertaken for the purpose of making it more certain. With the benefit of hindsight, it may now be said that the programme was flawed. It was mistaken in that it put great emphasis on codification of the rules of customary law rather than on the broad principles underlying such rules. History has shown that the codified rules did, in due course of time, become unacceptable to changing society and were ignored by the people, who evolved new customary rules in line with new circumstances. Had the exercise of codification dealt with broad principles, the courts would have been able to articulate and apply the principles of the new circumstances in the manner the English Common Law was developed by English courts. Since the majority of the people of Tanzania, particularly the rural population, still respect their customary laws, it is incumbent on us to establish a new programme to codify the common principles underlying African customary law in Tanzania. Once that is done, it would be for the Tanzanian courts to articulate and apply those principles to specific cases and changing times. Islamic law, on the other hand, by reason of its world-wide religious validity, cannot be integrated with customary law. In the Tanzanian context, Islamic law may be and is applied in peaceful coexistence with both customary law and statute law. On the mainland of Tanzania Islamic law applies only in family and inheritance matters in cases where the parties belong to the Islamic faith. In Zanzibar, Islamic law applies not only to matters of the family and inheritance, but also to matters not covered by statute law. The applicability of Islamic law is thus more extensive in Zanzibar than is the case on the mainland. That is one of the reasons why Zanzibar has, and must continue to have, its own autonomous legal system from the High Court downwards. It is unfortunate that the majority of the people of Tanzania are unaware of the law of the land, with the exception of customary law. Obviously Tanzanian law will not serve as a bond holding the people together unless and until a reasonable number of the people are made aware of it. This widespread ignorance of the law of the land is a threat to the integrity of the new multi-party democratic state. Realizing this danger Tanzanian judges and magistrates launched a public law literacy programme in March 1993 which is conducted through the radio, newspapers and public halls. One other matter which has to be addressed at once to facilitate the people’s awareness of their law is the translation of existing law into the common language of the people – that is – KISWAHILI. The Tanzanian parliament should start enacting statutes in Kiswahili instead of in English. I am one of a growing number of people who do not understand why this change has not been made up to now. After all, the Constitution of the United Republic as well as the Constitution of Zanzibar are in Kiswahili. The debates in the Parliament of Tanzania and in the House of Representatives in Zanzibar are conducted in Kiswahili. Of all the measures of legal reform that have been taken, that which lies within the field of Human Rights, is the most definitive of the new democratic order in Tanzania. In 1984 the Constitutions of the United Republic of Tanzania and Zanzibar were amended to incorporate a Bill of Rights. This historic step, taken four years before the collapse of the world-wide one party state system, necessarily requires the amendment or repeal of some legislation which is inconsistent with Human Rights. At the time when the Bill of Rights was introduced in the two constitutions, it was agreed that the Union Government should be given a period of grace of three years to put its house in order before the basic rights under the Union Constitution could be enforced in court. No similar period was required for the Zanzibar Government. It was understood that after the expiry of the period of grace, Human Rights reforms would be undertaken in the light of court decisions made in specific cases involving constitutional issues. That period of grace expired in 1987. Between 1987 and 1990 there were two cases in which the constitutionality of certain statutes was successfully challenged in the High Court. Then came 1991, when the Presidential Commission was appointed. In its report, submitted early in 1992, the Commission identified 40 laws which, in its opinion, were oppressive and violative of the Constitution. A large number of these laws are Zanzibar laws. The Commission recommended the amendment or repeal of these laws in order to create an environment conducive to the establishment of multi-party democracy. The Commission’s findings and recommendations appear to have served as a catalyst for the institution of court cases challenging the constitutionality of many of the laws listed as oppressive by the Commission. Undoubtedly this trend is bound to generate some heat between the Judiciary on the one hand and the Executive and the Legislature on the other, if the trend is mishandled. Fortunately, the Executive, which appears to be genuinely committed to the cause of human rights, has recently invited the Geneva-based Centre for Human Rights to assist it in formulating appropriate reforms and mechanisms. Obviously, reform of the law without reform of the mechanisms and institutions which administer the law cannot be successful. It is for that purpose that a wide-ranging study of the entire legal system in Tanzania has been initiated by the Tanzanian Government with the support of the World Bank and donor countries. The recommendations of the Study should have been presented to the Government towards the end of 1994. A donor’s conference is to be convened early in 1995 to determine how best the international community can assist Tanzania to establish a new legal order to underpin the new multi-party democratic state. Undoubtedly Tanzania faces a daunting task of reform of the legal order. Fortunately for us there is the will and commitment to do so. With appropriate assistance from the international community, Tanzania could be a model for African nation states ruled by law, rather than by the barrel of the gun. Asked about how difficult it had been for him during one party rule the Chief Justice said, with a smile on his face, that he was afraid that he was going to be asked how he could be taken seriously in view of what had happened at the time. He said that he had appeared twice before the CCM Political Bureau and the Party’s National Executive Committee in 1983 and had expressed his anxieties about actions which undermined the rule of law. The CCM had then called upon every Tanzanian to respect the rule of law but there had not been much follow-up action. One of the reasons why he had been chosen to head the Presidential Commission was that the Judiciary was the only organ of the state which had not been politicised. TWO GOVERNMENTS OR THREE. PRESENT SYSTEM DOES NOT WORK. In subsequent discussions the Chief Justice said that the Commission had recommended a true federal state (with three governments) but this was the one part of the recommendations which had not been unanimous. He maintained however that there was and is a consensus that the present (two-government) system does not work. In spite of the present acceptance of the status quo the issue would arise again. As if to underline what the Chief Justice said above on the importance of constitutional law, judgement has been given recently on a number of constitutional issues. At the High Court in Dodoma in mid-September, in what was described in the Business Times as a landmark case which would be a test of the independence of the judiciary, the firebrand politician the Rev. Christopher Mtikila presented a petition. Two judges indicated that they would prefer not to take the case. A third judge then took over. The petition proposed that there should be amendments to the 1977 Constitution, a referendum on the future of the Union, the convening of a national constitutional conference before the next elections, the proclamation of a Tanganyika Government, the amendment of the Political Parties Act of 1992, and permission for independent candidates (those not belonging to a political party) to take part in the elections. On September 22nd Judge Kahwa Lugakingira, at a packed hearing, dismissed the demands for changes in the Constitution because this was the function of Parliament and also rejected the idea of a referendum and a transitional government because these were matters to be decided at the ballot box. However, on October 24th, the Judge null if ied a provision of the Political Parties Act of 1992 under which parties were required to obtain permits from District Commissioners before holding rallies and he also agreed that independent candidates should be able to contest leadership positions. The judge said that some 20 million Tanzanians did not belong to political parties and DC’s were known to be CCM cadres. It was a joke for DC’s to exercise justice under such powers. This matter is of great concern to the popular Rev. Mtikila who would probably like to stand for president even though his party is not registered. In another case, this time taken by CHADEMA, High Court Judge Josephat Mackanja ordered Radio Tanzania to stop broadcasting a number of programmes produced by the CCM. But Constitutional Affairs Minister Samuel Sitta refused to accept part of these judgements and issued an order on November 10th stating that the restriction on holding rallies would continue and gave notice of appeal. This immediately placed District Commissioners and the Police in a precarious position. Zanzibar’s Chief Minister Omar Ali Juma said permits would still be required there. Zanzibar had its own High Court he said. Volume 1 of the Presidential Commission of Inquiry into Land Matters* has been published recently. Its Chairman, Professor Issa G Shivji has made available to Tanzanian Affairs a copy of an interview he gave to HARAMATA (a quarterly published by the IIED) in which he explained the Commission’s recommendations. There follows a summary of the interview. This regime continued after independence. In fact, the control of land by the Executive led to enormous abuses, contrary to the interest of rural land users and the long run interest of the nation. Some major changes in the structure of the government – decentralisation (1972)’ villagization (1972- 74) followed by reintroduction of local governments a decade later etc. led to total disruption of land administration. c) devise procedures which would be legitimate, accessible, open and transparent. Land would be placed squarely in the public domain under the broad regime of public law (constitution, basic law etc.). Our proposals assume a strong political will on the part of government to implement them. If the government were to implement them it would garner strong support from the people. It would also face strong opposition from vested interests. Asked about the next steps at a meeting in London sponsored by OXFAM on March 19th this year Professor Shivji said that Mwalimu Nyerere had advised the Commission to ensure that the report was published. If the people knew about it they would make sure that some action would be taken. He also said that the IMF/World Bank had brought considerable pressure to bear on the subject of land tenure. They wished to see arrangements made for privatisation so that owners would have an incentive to invest. But their wish was not supported by the people in the villages who were suspicious of attempts to take away their land. * REPORT OF THE PRESIDENTIAL COMMISSION OF INQUIRY INTO LAND MATTERS. Volume 1. Land Policy and Land Tenure. Scandinavian Institute of African Studies. Uppsala. Sweden. 350 pages. f 28.95. (Volume 2 is an analysis of 40 land disputes selected on the basis of their illustration of important socioeconomic trends and legal problems. As it contains sensitive matters its circulation will be limited). During 1993 and 1994 Ngara and Karagwe districts of Tanzania have received over 600,000 Rwandan and Burundian refugees. In late September 500,000 were still there and between 250 and 750 a day continued to arrive, adding to the Tanzanian population of 210,000. The Tanzanian and international response to this influx has been remarkably good, although the food pipeline is under strain. In addition, Tanzania has to bear the burden of patrolling the border and preventing camp violence from overflowing into the Districts. However, the response to the needs of the people of the two districts has been very much poorer. With the honourable exceptions of UNICEF, AMREF, Caritas of the Netherlands and of Germany, the ICRC, OXFAM and the UNHCR, the international agencies and NGO’s are not well informed about the true situation. Whether the recent analysis spearheaded by the Prime Ministers’s Office and the UNICEF report by the present author will change this remains to be seen. Over the years 1994 to 1999 the minimum cost in lost cash incomes and additional workload to the Tanzanians of Ngara and Karagwe will be about £40 million, an amount comparable with a whole year’s income of the residents of the Regions. Of this amount, food sales lost because of the ruined state of the roads and the collapse of the Kigali market account for over a third. These could be reversed by spending £14 to £17 million for the repair of the Kyaka-Rusumo highway and of the District networks and the installation of maintenance equipment at District and Regional levels assuming that the European Union completes work on the Burundi-Rusumo highway which has been delayed by the diversion of the contractor to camp building. Environmental damage will take at least five years to make good if the refugees leave within a year. Germany (DTZ) has begun replanting trees and is sponsoring projects to promote fuel efficiency, but trees take time to grow and the denuded areas already extend six miles beyond the confines of the largest camp. Many new wells are needed but the ground water supply cannot survive the trebling of the population of Ngara district. The Dutch, who, like UNICEF, take a direct interest in the problems of the Tanzanians as well as those of the refugees, are adding an agro-forestry and livestock element to their existing rural development programme by including Ngara and Karagwe in the Districts covered. Both the German and the Dutch initiatives are medium to long term. The losses suffered by the 100 or so villages may not seem large in terms of the replacement costs involved, but are massive for villages of between 1,500 and 3,000 inhabitants with a total annual cash income of perhaps £17,000. The difficulties encountered include pit latrines prematurely full, the stripping of trees and the burning of school furniture and books for fuel, the entire 1994 maize crop eaten green leaving no seed for planting, severe reduction of the plantain and potato crops eaten, or camped on, by refugees and the failure of springs. It appears that the only immediate help for villages hitherto has come from the Catholic and Anglican Dioceses and the Christian Council of Tanzania. Unless the rains fail, no overall food shortages are imminent. Indeed, banana and beer sales to refugees and broader trade with personnel serving the refugees have probably balanced the loss of normal crop sales to date, albeit not by the same households. After the initial jolt, UNICEF, AMREF and Caritas have restored Government and Church medical supply systems reasonably fully and have helped to find additional staff to meet refugee needs. The Tanzanian performance at national, regional, district and village levels is remarkable. But at each of these levels Tanzania lacks the resources to make whole again. About £20 to £25 million are needed to do that, over half for transport system restoration and a third for wood and water balance reconstruction. The problems, especially as regards wood and water, will spiral out of control if the refugees remain where they are indefinitely. They will not return to Rwanda in the near future, if at all. The ‘dead boat’ still fishes for murdered men, women and children in the River Rusumo; wounded refugees arrive daily; all too credible reports of killings and looting are regularly received. Mwalimu Nyerere went to urge return, but on hearing and seeing he stated categorically that it could not happen before 1998 and should not happen now. The only real alternative to the Kagera camps is 10 clusters of refugee villages of 4,000 inhabitants each dispersed throughout Tanzania. These could eventually become normal communities self-sufficient in food and basic services and enable the refugees to build new lives for themselves. In refugee camps only hate grows. The obstacles confronting such an approach are twofold. First, it is hardly an easy option for Tanzania’s leaders to espouse during the run-up to a general election. Secondly, the infrastructure cost, judging from the experience of the refugee crisis of 1959-60, may exceed £140 million and the moving and settling-in costs a further £30 million. Mobilising funds of that order will be hard, with the UN and UNHCR relentlessly demanding early return of the refugees, apparently for budgetary reasons unconnected with any serious assessment of the Rwanda situation. At a one-day summit in Kampala on November 26 the presidents of Kenya, Uganda and Tanzania agreed that the secretariat of the about to be revived East African Community would be in the old community headquarters at Arusha. A new secretariat will start functioning in March 1995 and each country has agreed to contribute US$ 1.0 million for the first year’s operations. Travel is to be eased between the three countries. There will be swifter clearing for East African citizens at airports and plans are being made for the issue of a standard East African travel document. The Presidents agreed to work towards forming a customs union, to harmonise policies in financial sectors and promote investment.